Part workshop, part performance, part exhibit, the Mechanical Ensemble Workshop combines construction, art and engineering while learning some basics about mechanical movement and control. 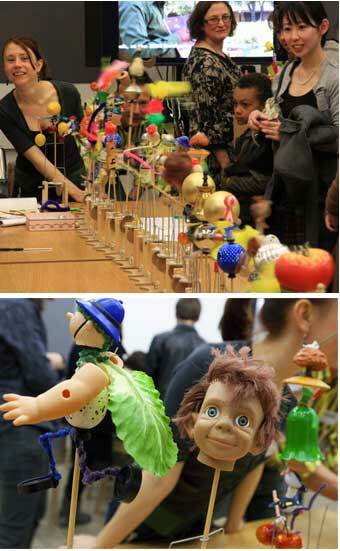 Participants make individual cam driven automata from push-fit components and a junk box of curious and colourful random objects. The automata are then linked together to create a single machine, an impressive snaking line of spinning cams, colours and shapes turned by a single handle or motor. It’s an attention-grabbing centrepiece display. The workshop is entertaining and sociable as people collaborate together to join their individual creations and patrol the ever-expanding line of moving machines to fix breakdowns and keep it turning smoothly. Currently there are enough components to build 57 machines with a linked length of around 8.5 meters. This record breaker has only been done once, at Wilton’s Music Hall (London) in February 2015. It appeals to all ages: it’s been used extremely successfully in primary schools, mixed age family events, and in adult social/art/talk/making events. Note that the machines cannot be taken home. But the end result makes for great photos and videos as souvenirs of the event.